I'm starting off today's blog post with a list of my favourite beauty/hair/lifestyle products, I've narrowed the list down to four key products that I've been using over the past few weeks. 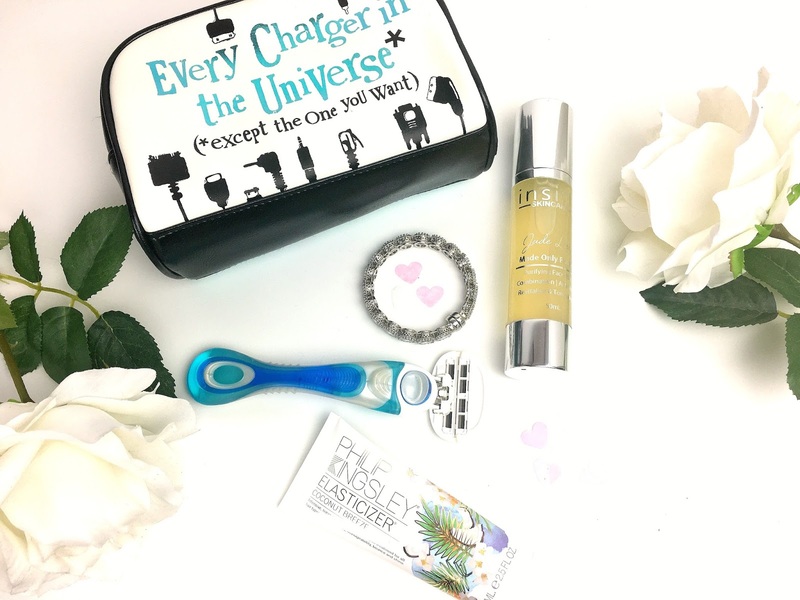 I really love looking back on these posts to see what type of beauty/hair products I have been using and this month, my most used product is the Dorco Eve razor. Until I finally get lazer hair removal, I will forever use razors. They are simple to use and quick and I've been using disposable razors for years. My leg hair grows back really quickly so I am forever having to touch up my legs before a night out or while I am in the shower. When I was kindly sent the Dorco EVE razor* to try, I was curious to see how different the experience would be. The box arrived with two attachable blades and straight away I was impressed with the razor design. The handle is easy to hold and I found this really made a difference compared to my usual disposable razors. With spring almost here, it is time to grab my fake tan and my razor to make sure my legs are...well waking up from their winter hibernation. I am pretty excited about the new version of the Elasticizer*, if you don't know - Philip Kingsley created this for Audrey Hepburn. It protects hair from breaking and it was the worlds first pre-shampoo treatment. 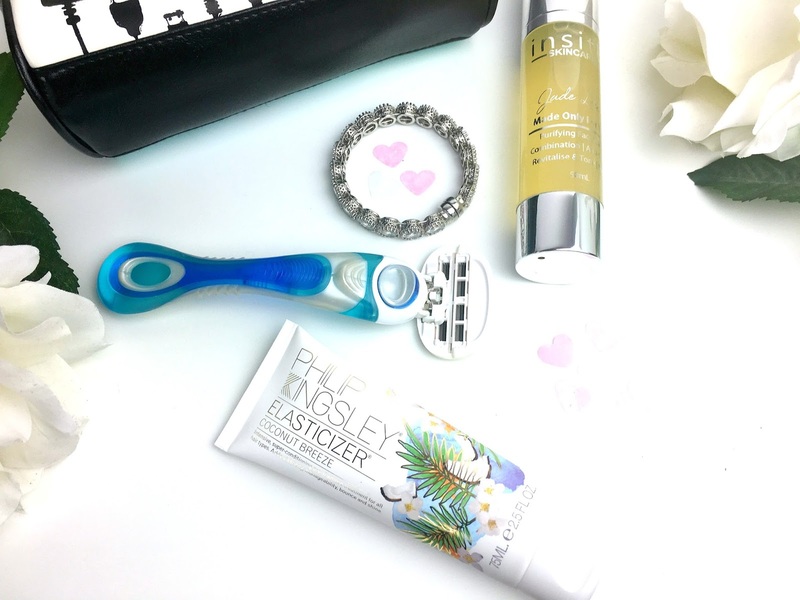 I recently attended the summer launch of the Philip Kingsley range and they will be launching a coconut scented version. I am a very big fan of the coconut scented products (and Vita Coco of course) so I have been loving adding this to my hair routine. The packaging is beautiful and my hair condition is slowly improving, especially the ends. Oh my goodness, the Charger Cable Bag* has seriously been helping me get organised. Since I have started filming sections for my future Youtube channel, I constantly need batteries, a charger and headphones. I've been keeping them stored in this bag and I love that it's labelled from the outside so I already know what I've kept in it. I really do struggle with keeping things in the right place so this small bag has seriously been a stress savior for me. I remember watching a video on Facebook about Estée Lauder launching a personalised foundation and I thought how clever the idea was. A few days later I discovered insitU, a skincare brand that creates skin care just for you. I visited the website and I thought I would give it a try. As you all know, my skin is very oily but my cheeks have become quite dry due to the weather. I was able to include this information when I was ordering my insitU Face Wash.